This is a quick addition to the series on former Salt Lake County Attorney Harold Wallace. He had a private office in the Judge Building so we thought we’d share a picture of it. The building itself was constructed in 1907 and was named after Mary H. Judge, a local businesswoman. The architect was David C. Dart. Third South and Main Street. Image taken circa 1940. Salt Lake County Tax Appraisal Photographs, serial 1-1966. 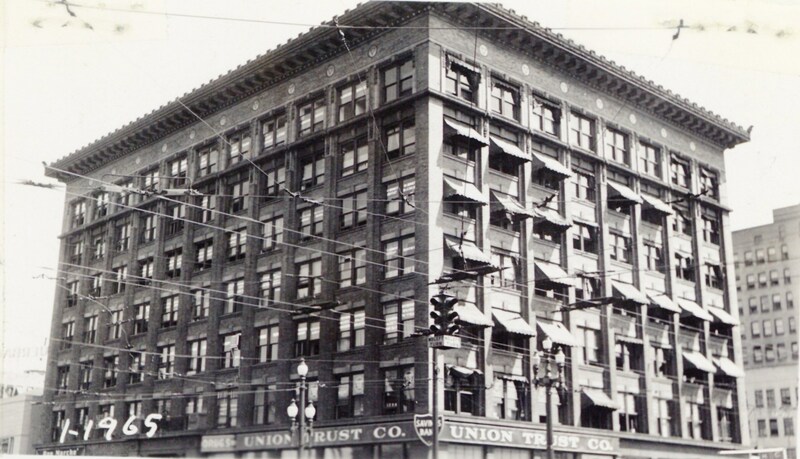 Source: John S. McCormick, The Historic Buildings of Downtown Salt Lake City, (Utah State Historical Society: Salt Lake City, Utah), 1982, p. 95. This entry was posted in Salt Lake history and tagged Harold Wallace, Judge Building, Salt Lake County Attorney. Bookmark the permalink. Thanks Guy’s, perhaps it was changed to Boston Building, later Years Dentist in it. Seems to me same building, as I remember & Location, west side, don’t recall it Boston Building was on East side.